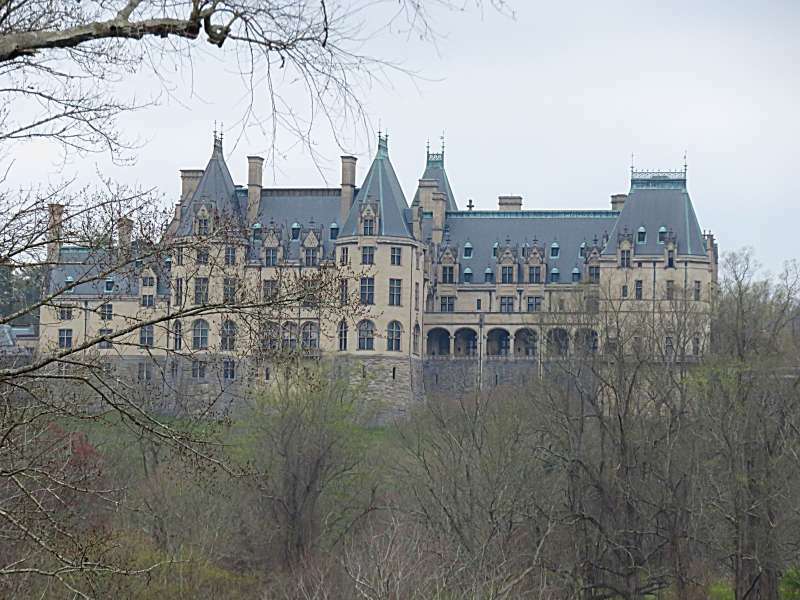 Biltmore - America's largest private house. 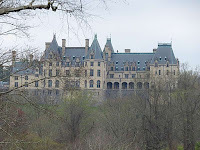 Our plan was to visit Biltmore Estate in North Carolina to see the azaleas flowering. David has a soft spot for azaleas. This particular plan also involved blue skies and sunshine. I have a soft spot for not being cold and wet. Unfortunately neither the weather nor the azaleas co-operated. On the day of our visit, in early April, the skies were grey, the weather was cold, there was a constant threat of rain and only a few of Biltmore's azalea bushes had begun to blossom. At least the tulips were flowering. They were a great consolation prize. It is hard to imagine a more perfect flower. There were row upon row of them - vivid yellows, reds and purples all in full bloom challenging the chilly weather to move over and make way for spring. Have you noticed how historic houses always showcase the achievements of men? Women barely get a mention, and when they do it is often only in supporting roles. The grand houses we visited on our road and cycling trip through America's north-east were almost all built by men and, with few exceptions, the history of the houses highlighted the achievements of the men who lived in them. Visiting estates such as George Washington's Mount Vernon, Henry Francis Du Pont's Winterthur and even Edward Berwind's The Elms, you could sometimes be forgiven for wondering what roles their wives played in life. Edward Berwind's wife was so tucked away in the minutia of his life history I had to dig deep even to discover her name. How refreshing then, on our last historic house tour, to visit The Mount; planned, built and made famous by a woman. Wintethur and the art of avoiding museums on your travels! 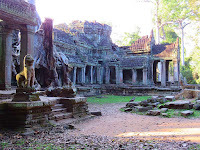 The world is divided into two kinds of travellers. I call them the 'museum people' and the 'spending an afternoon in a museum is my worst nightmare people' ('non-museum people' for short). Can you guess which one I am? It is not that non-museum people won't set foot 'ever' inside a museum (imagine coming home from Paris and announcing to your friends that you skipped the Louvre because it sounded boring!) it is just that in order to survive large museums you have to have a plan - and you have to stick to it. Cycling the Mount Vernon Trail to Tudor Place and Dumbarton Oaks Gardens, Washington D.C.
south to Theodore Roosevelt Island, just past Arlington Cemetery - click here for a trail map. Still jet-lagged and nowhere near as fit as we would have liked to be (are we ever! ), we parked the car at Daingerfield Island about 7 miles from our objective at Georgetown. I know, I know 7 miles is pretty whimpy but we had just flown from Sydney, Australia. The sealed surface of the trail made the cycling easy - thankfully! Even the few small uphill sections slipped easily beneath the rhythm of our wheels. With a single interruption where we passed Ronald Reagan Washington Airport (I love airports as long as I don't have to arrive or depart from them) this section of the trail runs along the western bank of the Potomac River and has some beautiful views across the water. There is nothing like a nice view to make the cycling easier.